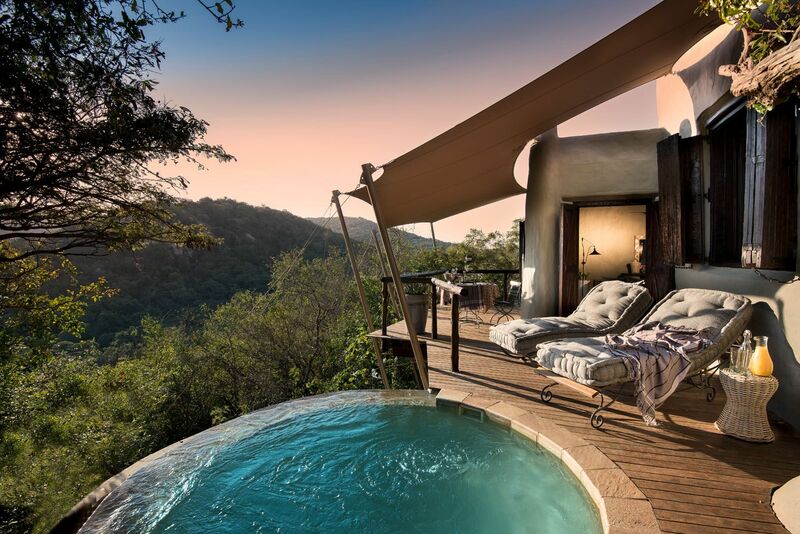 Set in a thriving private game reserve at the heart of Zululand in South Africa, Phinda Rock Lodge is a hotel on the edge of wilderness—a fact immediately apparent even before I landed. As our Airlink flight was making its final approach, I spotted a giraffe peering from the treeline and a herd of impalas skipping towards the bush. On the 15-minute drive to the hotel, I was greeted by a throng of zebras, nyalas, wildebeests and warthogs—it already felt like I was on a safari even before the first game drive. Blink and you will miss Phinda Rock Lodge's stone grey facade, which emerges like a natural rock formation atop a cliff. Its strategic location offers a great vantage point to take in the panorama of the bush, including a clear view of Leopard Rock that is home to a troop of baboons. The viewing deck is one of the areas that was improved in its recent renovation—it was expanded to house a new seating space where one can observe the flourishing bird life and the passing animals below. Another addition is a rooftop area on the main building, where guests can eat, drink and stargaze. Find out what else is in store at this well-loved signature property of andBeyond. Exhilarated after all the wildlife I encountered on the drive up, the gregarious hotel manager Obed, who has been with the company for 22 years, gave me a warm welcome to my home in the bush. As he was showing me around the hotel, I was immediately impressed by how it's luxurious but not pretentious, considered but not overdone—just the kind of place perfect for a safari holiday. The renovation builds on the distinctive character the hotel has developed over two decades, and the interiors are just as you’d expect it. The spartan stone and adobe shell are filled with a rich tapestry of earthy hues and natural materials. From the hippopotamus skull that greets guests at the entrance, the furniture pieces swathed in animal hide, and the smattering of Zulu-inspired decor touches, it embraces a decadent yet down-to-earth aesthetic. The hotel’s intimate size (it has only six suites) and open design (it isn’t fenced in) allow for an up-close and personal encounter with the animals, as well as the fellow guests. I saw a nyala calmly roaming right outside my door, and enjoyed watching an elephant drink from a watering hole nearby. I also spent some time with the other guests, which were a mix of locals who frequent safari lodges and first-timers like myself. Every suite offers the same amenities but in varying configurations. I stayed in Room 2 (seen above), which is closest to the main areas of the hotel. I particularly enjoyed the wide terrace, the sitting area furnished like a reading nook, and the spacious bathroom with its large picture windows. I also liked how andBeyond focuses on the details like the mini-bar, which featured a great selection of local drinks and snacks, including a delicious hand-crafted gin. That was especially timely given how the boutique gin movement is booming in South Africa. Game drives are the backbone of every safari experience and this is clearly a priority at Phinda Rock Lodge. A stay includes three-hour-long game drives twice a day—the first begins at the crack of dawn and the other a few hours before the sun sets. This is the best time to see the animals in action, breathe in the fresh air, and revel in the golden light... it also gave us a chance to savour coffee with Amarula liqueur in the morning and champagne in the evening as a reward for all that wildlife spotting. Our ranger Ben and tracker Bongani worked tirelessly to show us the bounty of the bush on every drive. Their hard work paid off: we saw the Big Five in a single day, a commonly used term that refers to the hardest animals to hunt (and spot), namely the elephant, lion, leopard, buffalo and rhinoceros. Like most safari trips, food and drink are all-inclusive but what sets Phinda Rock Lodge is their personal touch. The small scale of the property allows for truly delicious home-cooked dishes made by the resident cook, Lindy. From the "breakfast of champions" (fresh fruit, a platter of meat and cheese, homemade muesli and that's just for starters) to the local farewell feast they presented at the roof deck, the food was one of the most memorable aspects of the hotel. Meals are served during set times with your butler personally serving you breakfast, lunch, and dinner. Should you want a different arrangement, however, nothing is too much to ask. Given the isolated location of the hotel, the sheer variety, quantity and quality of the food was indeed a pleasant surprise. While most travellers visit South Africa during the summer (especially over Christmas and New Year holidays), winter is the best time for game viewing especially at this reserve. I visited in early August and while I didn't really use the plunge pool, the cool mornings and evenings allowed for longer game drives. In addition, my butler Sithe recommended booking Room 5 or 6 on my next visit. These suites look onto the watering hole nearby, thus are particularly poised for watching animals right from the private terrace. Sometimes elephants even drink from the room’s private plunge pool itself! If you're keen to spend a longer time at Phinda to see the various areas of the reserve, you can also check out the sister properties Phinda Forest Lodge and Phinda Mountain Lodge. For more information, visit andBeyond and Air Link.